Even people who literally are trying to save the world find it necessary to organize time for rest. This weekend I was at a conference in Atlanta, Georgia, giving a talk about deliberate rest. By coincidence, the conference center where I was speaking was near Centennial Olympic Park, the starting-place for the Women’s March. My wife and her family would be marching a few hours later in San Francisco; since I couldn’t join them I took some time from my day and joined the marchers in Atlanta. 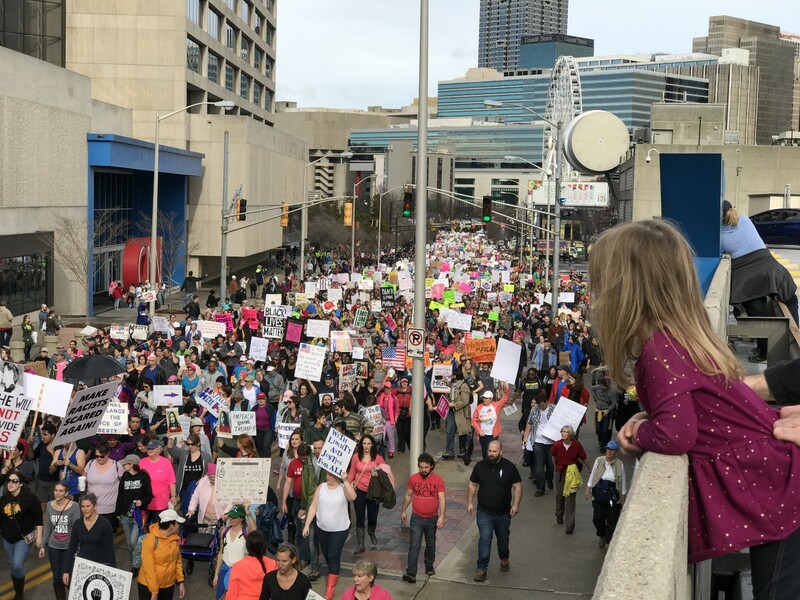 I hadn’t expected it, but you really feel the weight of history when you march in Atlanta. This was, after all, one of the centers of the civil rights movement, and one of the places where our modern understanding of human rights was developed. Many of the people there shared a sense of unease and uncertainty about how the next four years will unfold, and a desire to organize and work to preserve gains in areas like marriage and reproductive rights that seem newly vulnerable. We have a long tradition of describing advocates and reformers as “tireless workers,” as people of complete conviction and focus. It’s tempting to assume that for people in a life-and-death struggle, rest is a luxury, a waste of time that the world can ill afford. That would be wrong. As I discovered when working on my book Rest, even people who literally are trying to save the world find it necessary to organize time for rest. Let me offer a couple examples. During his time as commander of Allied forces in Europe, General Dwight Eisenhower regularly worked 15-hour days planning the American landing in North Africa, and building the forces necessary to retake Europe from the Nazis. A few weeks after he arrived in London, Ike’s chief of staff rented a small cottage outside London for use as a getaway, a place where Eisenhower could eat simple meals (Ike was uncomfortable at formal English dinners), play bridge with his senior staff (they were the only ones who even knew about the Cottage), and work on his golf game. Shop talk was strictly forbidden. Eisenhower would go on to become one of the great heroes of World War II, celebrated as a brilliant general and a model of American confidence and character; but in 1942 he was a career staff officer, in his first major command and tasked with an immensely difficult job. It was an early sign of his fitness for leadership that he recognized the need to restore his psychological reserves, to literally make space for rest. Los Alamos director J. Robert Oppenheimer soon realized that without some way to blow off steam, people would begin to break down. He encouraged scientists and their families to go hiking in the mountains on weekends; on many Sundays, you could join a half dozen Nobel laureates heading for one or another nearby peak (often followed by armed guards). During the first winter, a Harvard professor and explosives expert cleared a ski trail, and on snowy days staff would get in a few runs before heading to the lab. Likewise, World War II cryptographers had to be carefully managed to avoid nervous breakdowns. It was of tremendous importance to decode enemy communications, but the pressure of the work, the devious complexity of codes, and the immense stakes could drive code-breakers beyond the breaking point. Cryptographers even attacked each other’s code rooms with floods of gibberish, in an effort to force codebreakers to exhaust themselves on pointless work. As historian Steven E. Maffeo put it, section chiefs recognized that “a top cryptanalyst with his teeth in a problem could never let it go,” and would work themselves to exhaustion if not diverted. As a result, the best managed their staff “in a way a cruiser commander might husband his fuel supply against the hours when it would have to be lavishly expended,” discouraging them from working beyond their capacity, and periodically forcing them out of the office. Talking about Rest after the Women’s March reminded me that if the world needs your best, it needs you rested. The strategists and scientists and code-breakers spent their professional lives training for such challenges; they often had friends or family in harms’ way; and they knew their work could literally change the course of the war. Yet they also recognized that in long wars, it’s better to maintain your capacity to fight, than to sacrifice yourself. Their experience teaches us that self-care is not indulgence, nor is it a retreat; it’s an essential means of gathering your strength so you can fight on. I'm a Silicon Valley-based author and consultant. I study people, technology, and the worlds they make. I have a Ph.D. in history of science, and have taught at Stanford, UC Davis, UC Berkeley, and Williams College. My book REST: WHY YOU GET MORE DONE WITH YOU WORK LESS (http://www.deliberate.rest) was published in 2016, and has been translated into a dozen languages; my 2013 book, THE DISTRACTION ADDICTION, is about the practice of "contemplative computing," ways of using information technologies to be more focused and mindful rather than constantly distracted.